Posted September 15th, 2005 by Ms. Jen & filed under tidbits. He glances in the basket and then nervously back at me. Jerry is looking a tad bit freaked out by me and is trying to nonchalantly glance around for a manager, but he answers me anyway. Posted September 14th, 2005 by Ms. Jen & filed under photos + text from the road. 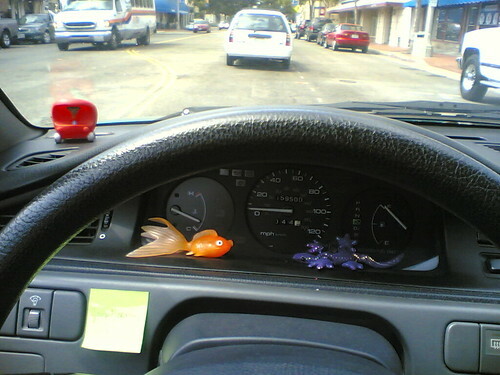 Wed 09.14.05 – Lowly Worm in his apple car, an orange fighting fish, and the purple disco gecko. Posted September 13th, 2005 by Ms. Jen & filed under photos + text from the road. 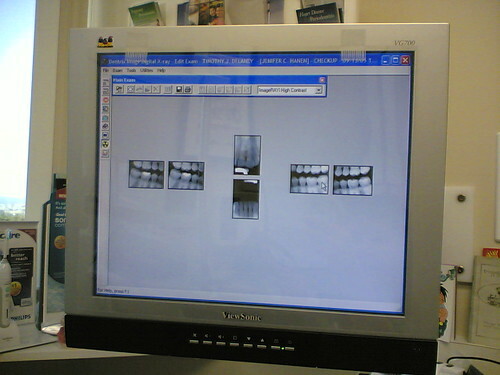 Tue 09.13.05 – I have loved going to the dentist. Weird, I know. Dr. Delaney’s office stays on the cutting edge. My check up x-rays this morning were taken with a wired sensor that immediately displayed my x-rays on the monitor. Very cool! Posted September 13th, 2005 by Ms. Jen & filed under news + events. Mon 09.12.05 – First Flash Class. Bad JuJu or Bad Tempers or …??? Posted September 11th, 2005 by Ms. Jen & filed under ideas + opinions. What is up in the last week? Folks reacting to the Hurricane Katrina tradegy or the memories of 9/11? Or is it high gas and other prices with lackluster job market and no real raises? Or is it all of the above or Fearful Zeitgeist or is it bad juju running around? Why do I ask? Folks at the Moving Sale seemed sparse and spooked. A good portion of the men walking through the door at Alex’s this last week plus have been very short tempered. A lot of anger. Dang, I am GLAD that my rock’n’roll career is almost over. I have met some fabulous and lovely people, but I have met more cretins and distrubed folk than I care to admit. I am deep down over it. Posted September 11th, 2005 by Ms. Jen & filed under photos + text from the road. 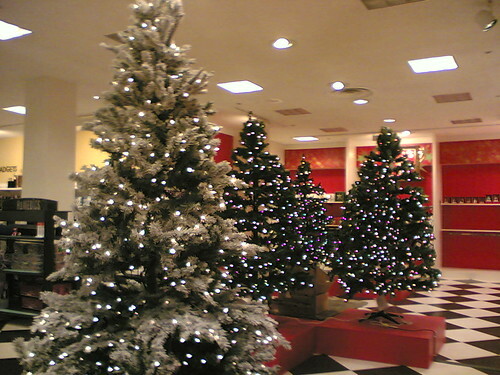 Sun 09.11.05 – Macy’s has their Christmas trees up already… Aren’t they supposed to wait until after Halloween? Posted September 10th, 2005 by Ms. Jen & filed under photos + text from the road. 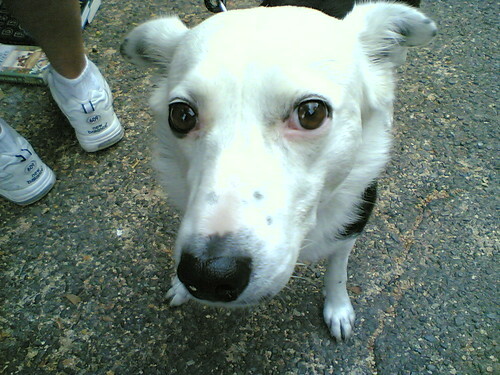 Sat 09.10.05 – Mindy the border collie came by the moving sale. 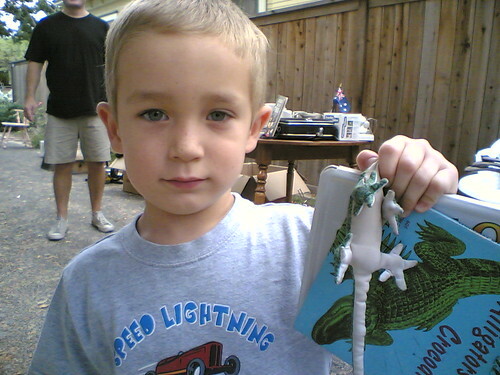 Sat 09.10.05 – Logan purchases Erika’s gecko.